LMD BarPack is a collection of 8 native VCL components that can be compiled into your application royalty free. This package contains advanced bar controls (TLMDSectionBar and TLMDExplorerBar) which help to integrate advanced GUI features into your applications. Included controls are characterized by extremly high flexibility regarding their visual features and internal data handling. In addition advanced editors will speed up development at designtime. Includes additional 25+ components from the shared LMD VCL runtime package. 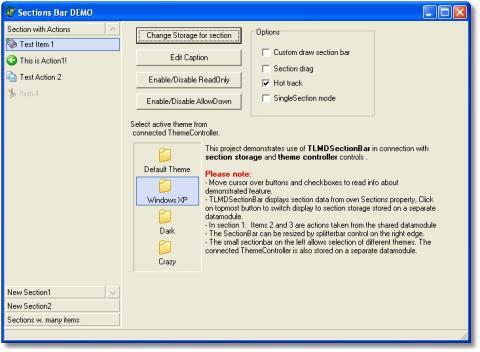 Also available as part of LMD-Tools or LMD VCL Complete. The screenshot below demonstrates different container types (HTML Text with glyphs and connected actions, custom containers like TListBox or Tree control). 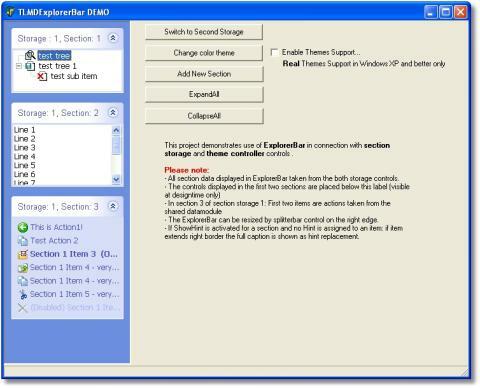 Screenshot of the SectionBar project: Demonstrates use of external storage containers, different theme controllers and use of TAction objects.